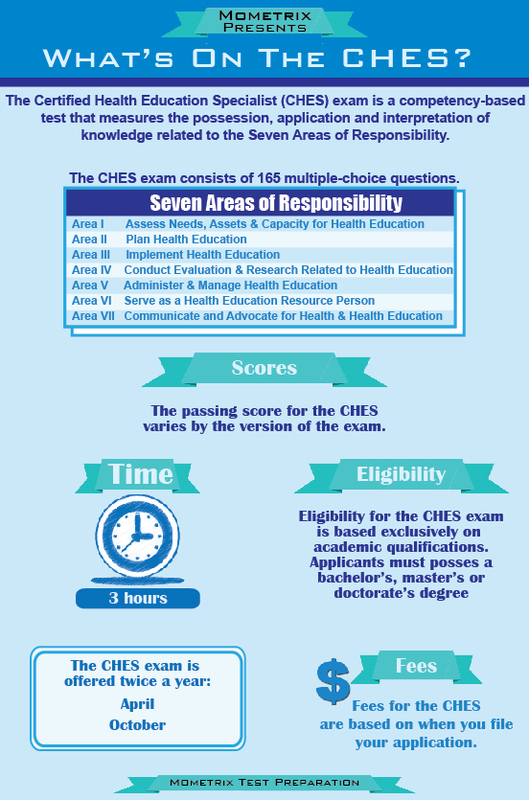 The CHES (Certified Health Education Specialist) exam measures the competency of candidates who aspire to be entry-level health educators. The exam is comprised of 150 multiple-choice questions in paper-and-pencil format. Offered at 120 test sites nationwide, the exam can be taken twice a year, in April and in October. An official transcript showing at least 25 semester hours or 37 quarter hours of course work addressing the seven areas of competency listed above. What is the name of the term that measures an outcome that is designed to identify the rate of occurrence of an issue? Once a specific population has been identified through the needs assessment for health education, what would be one of the next steps in the planning process? In the PRECEDE-PROCEED model, what step should be taken in phase 5? What is the name of the planning model that utilizes five phases (goals selection, intervention planning, program development, implementation preparations, and evaluation)? Which of the following would not be a term used in descriptive statistics? B: A clinical indicator is a type of secondary data that can be utilized as part of existing health records. A clinical indicator measures the outcome of care. It should be designed in a way that alerts a clinician to a certain event. A clinical indicator does not provide an answer to an issue but instead flags a problem that needs to be addressed. It provides a way to identify issues that need to be improved upon. Clinical indicators can be compared against national benchmarks. An example of a clinical indicator that a health education specialist may use would be body mass index values for an elementary school to determine obesity rates. A: When planning a health education program, it is important to obtain support from members of the community in order to increase the chances that the program will be a success. The support should come from key leaders or members of the community including local politicians, members of the clergy, or local health agencies. It is also important to involve members associated with the population that is being targeted such as individuals who are directly affected or leaders within that population. Community groups should also be approached to obtain commitment to the health education program. A planning committee can be established utilizing individuals from the various groups, and a group leader should be selected. B: The PRECEDE-PROCEED model was initially developed in the 1970s and was revised in the 1980s to include five additional phases. There are nine phases altogether in this planning model for health education that apply to the priority population. Phase 1 is social assessment where the quality of life of the population being addressed is examined. Phase 2 is epidemiological assessment where the health issues are examined. Behavioral and environmental assessment is the third phase risk factors associated where the health problems are identified. Phase 4 is the educational and ecological assessment where various behaviors are identified. Phase 5 is the administrative and policy assessment where resources are identified for the program. Phase 6 is implementation. Phases 7, 8, and 9 are the process, impact, and outcome evaluations. C: MATCH is an acronym for Mobilizing Action Toward Community Health. The MATCH model is a community-based, multilevel model that utilizes five phases. Within each phase, there are several steps. The first phase is selection of goals, taking into account prevalence, population, and behavioral and environmental goals. The second phase is intervention planning, which takes into account the targets of the intervention, objectives, mediators, and the approaches to be used. The third phase of MATCH is program development, which creates the components of the program; develops the curriculum, learning objectives, and materials to be used; and develops the session plans and materials. The fourth phase is implementation preparations where individuals are trained as implementers and ways to help make implementation easier are identified. The last phase is evaluation where the process is evaluated, the impact of the program is determined, and outcomes are monitored. A: Descriptive statistics involves the use of tables, graphs, charts, and numbers to organize data. It is used to look at the location of data and where the data fall. It looks at the variability of data (dispersion) and measures the variance and standard deviation. It also looks at the symmetrical pattern of the data (skew) as well as the peakedness (kurtosis) of the data. Variables are quantities or qualities and are divided into three groups: nominal (names or categories), ordinal (order or rank of the variables), and interval variables (numeric). 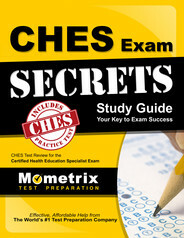 Ace the CHES test using our CHES exam study guide with practice questions. 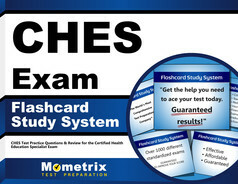 Quickly Solve Difficult CHES Test Questions with the CHES Flashcard Study System.